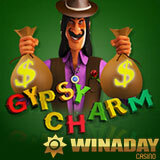 WinADay Casino has just paid out a massive progressive jackpot win -- the first jackpot win on its new Gypsy Charm slot. Donald T., an ex-military officer who became a high school teacher after active duty, won $202,107. He was playing Gypsy Charm on his iPad while his wife was across the room watching late night TV shows. Donald He said he only plays a few games that he really likes, varying his bets depending on how lucky he feels. The last big jackpot winner was in March when Mary J won $101,082 playing the Busted slot game. She took a road trip across America with her win. Donald says he’ll buy a new home and his wife needs some surgery. He also has a special gift in mind for the son who got him playing that night. Gypsy Charm, one of WinADay’s 32 premium slots, has a Fortune Teller bonus game where players choose Tarot cards to reveal prizes. When free spins are triggered, one whole reel becomes Wild, increasing winning combinations. WinADay Casino also has 16 penny slots, 6 video poker games, Keno and Roulette. A brand new real money online slot game based on Greek mythology, is expected mid-November.